Not far outside of Taos, New Mexico, there’s a stretch of raw, scrubby desert inhabited by the oddest assortment of people. Here you’ll find young eco-yuppie families living in yurts and earth-ships, burnt out war veterans in sheet-metal shacks, gun-hoarding wingnuts, cultish hippies, freedom-loving anarchists, ranchers, ramblers and rogues. They’re drawn here by dreams or desperation, hoping to start fresh, paint new lives on the desert’s wide, blank canvas. Some are just hoping to play out the rest of their days unnoticed and unfettered, quietly drowning in their own histories, demons and addictions. And some have simply washed up there by chance, relegated to society’s fringe by circumstance or lack of options. 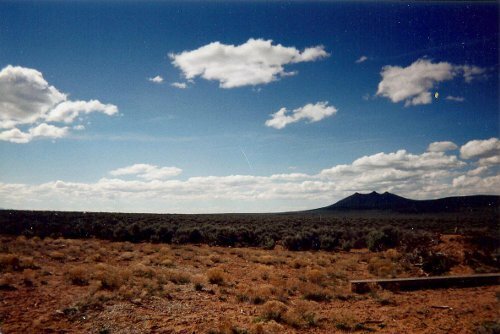 This somewhat uncivilized off-grid realm is known locally, and often with a tone of disdainful mystery, as “the Mesa”. Now I don’t know what it’s like these days, but when I lived there, the Mesa was considered by the “townies” of Taos to be a lawless and chaotic Neverland. The roads were packed, rutted dirt, that mangled axles and became an impassable mess in bad weather. We’d often walk or hitchhike those treacherous roads, sooner than drive them – even when it meant hauling water or food back home on our backs. Dwellings were spaced far apart, dotting a drab landscape of sage-like silvery wormwood, spreading monochromatically like asphalt in every direction. I compare it to asphalt because the plant is an introduced species, overly-proliferative, smothering what little diversity a high-desert ecosystem might normally have. It suppresses the growth of any other desert vegetation, thwarting the potential of beneficial grasses and vibrant flowers: squashed before they could even bloom. Pulling up sage became a daily job on our half-acre of land, the humble patch of dry, scraggly Earth which I had bought with my closest friend, right at the onset of winter. We had bought this land as an antidote to the trappings of the culture around us, a chance to rebuild at least our own subjective realities. We were young and full of ideas, pursuing self-sufficiency and sustainability and freedom. We wanted to build houses out of dirt and grow corn and beans, write books and push boundaries. So we pulled up those scratchy sage bushes to clear areas for building, pulled them up to dry for firewood, pulled them up because we were sick of looking at them. For me, the sage became a ubiquitously irritating metaphor. But at least it smelled good when it burned. I had loved the western high-desert at first sight. Some combination of the crisp, thin air, the endless skies, an indefinable sense of directness and truth. It felt boundless – an ocean of possibility, and we were ready to dive in. We purchased our half-acre from a rather shady character, bundled in a puffy coat, shifty and mysterious behind dark sunglasses. He had made it clear that he needed to get out of town. Fast. And was thus willing to give us a pretty excellent deal on his property. We handed him a wad of cash at the county clerk’s office, and relished our apparent good fortune. The half-acre had good drainage and a nice view of a nearby hill, actually an inactive volcano. It came with some tools, a run-down RV, a basic shed, and a smashed-up SUV. The tools were a blessing, as was the RV, since my friend had a wife and a baby to worry about, and adequate shelter was something they had been sorely lacking. After we installed a wood-burning stove in it, the RV became a pleasant and relatively safe little home for their budding family. The junked SUV left on the property was less useful. It was an ugly eye-sore, and at times we would go at it with a pick-axe or a sledge-hammer, enjoying the satisfying crunch of metal meeting metal – our cathartic, symbolic revolt against the suburban culture we had grown up to despise. While my friends now had the RV, my only home was still my van, furnished with several plastic storage bins, and a large sheet of plywood laid over top for a sleeping surface. The storage bins contained mostly books. A lot of books. Way more books than someone who was, for all intents and purposes, a homeless traveling bum, would ever actually need to keep on hand. I also had a bin of clothes, though that one stayed shut most of the time, since it was winter and I was pretty much wearing everything I owned. The New Mexican high-desert is, technically, part of the Rocky Mountains – the lower foothills. Our elevation was around 7000 feet, and the winter was bitter. Luckily, I had a quality down-filled sleeping bag that a friend in Virginia (I’ll always be grateful, Hap) gifted me when I first started traveling. That, combined with multiple hooded sweatshirts and three layers of socks, kept the threat of frost-bite at bay. But the chill nights did offer one spectacular compensation – the most amazing, mouth-gaping, breath-taking starry skies I have ever seen, and maybe ever will. A fair trade, I say. Living on the mesa was, at first, a liberating but challenging adventure. We were free from the utility grid-system, the duties and despair of consumer/wage-earner culture, and the oft-oppressive constraints of society at large. Ensuring our supply of things like adequate water and firewood was a daily concern, but there was something satisfying in working for our immediate survival. We had big dreams about growing our own food, building with sustainable techniques, using wind and solar, learning new skills, et cetera and so on. My friend had been my closest cohort for a few years at this point, my hetero-life-partner I liked to say, and this was our dream coming true. I felt optimistic about everything, like we were truly reinventing things – not just with arm-chair theorizing and reactionary protest, not just with letters to Congress and pamphlets and angry music, but by actually going out and creating the lives we wanted. But something happened out there. The disconnection from civilization, while a welcome respite for me, seemed to gnaw at the happiness and sanity of my friend. His less-admirable tendencies began to take over, and he became isolated, a bit neurotic. Meanwhile, other people had come to stay on our land with us, a turn of events that didn’t turn out so well for me. Without divulging messy details, I can only say that I saw some dark sides of human nature during these months. It eventually became clear to me that it was time to move on. My friend and I had a falling out, culminating in my escape from the desert, and the abandonment of my emotional and material investment therein. The dream, unceremoniously, came crashing down. My exodus from the desert was, in retrospect, a good and necessary thing. It allowed me to grow, though I was sorry that it came at the price of a friendship. We’ve since made amends, and perhaps he is stronger for having faced the “abyss” and returned. Me, I had a new chapter of life ahead of me. Because fortunately (and thank the gods! ), it seems the old adage is true – when one door closes, another always opens. During that strange and dramatic period out on the Mesa, I had also met a girl. My love. And we soon began our own dream together, on greener pastures with happier endings. We traveled insatiably, all over the country – first cramped with a dog in a sub-compact car, then later wandering the country again in another van, vastly more comfortable than my last (this one had an actual bed installed – goodbye plywood!) Nowadays, we’re a bit more sedentary, and we’re saving up to buy another piece of land, our own version of paradise. So that particular dream, bruised and tangled as it is by the past, does smolder on. Dreams can be resilient things. When I think about the mesa – with its population of the untamed, the hopeful and the hopeless, with its bleak landscapes and extreme conditions, its drug-addicts and activists and lost, aging souls – I think about dignity. Simple dignity, the goal that I believe underlies many of our decisions in life. It’s the hunt for dignity which pushes us into low-paying jobs and car leases we can’t afford. It’s dignity we long for when arguing with relatives or fighting alcoholism or talking our way out of a speeding ticket. And it’s dignity which has me still hoping to one day own my own bit of Earth again, to create a home and a name and a purpose in this crazy, chaotic, beautifully confounding world.